Washington Redskins left tackle Trent Williams will be making another trip to Hawaii to play in the 2014 Pro Bowl on January 26, 2014. 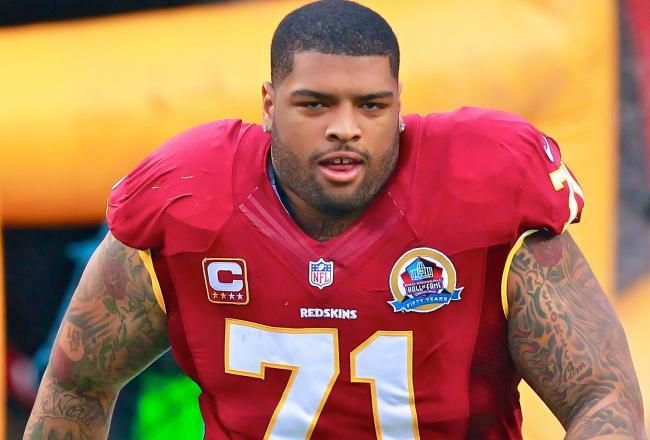 Trent Williams was the only Redskins player to be named to the squad and will be attending his second straight Pro Bowl, although last year he didn’t actually play in the game after being attacked in a night club. Several Redskins players were named as alternates as DeAngelo Hall, Pierre Garcon, Alfred Morris, and Brian Orakpo will be available to fill in for any players who may miss the game due to injury. The most notable Redskins snubs this year were WR Pierre Garcon (who leads the NFL with 107 catches) and RB Alfred Morris although a very good argument could also be made for DeAngelo Hall, who may be finishing up his best year as a pro. The Pro Bowl will have a completely different structure to it this year, starting with how the players were picked. Instead of picking a NFC and AFC squad like in years past, this years voting system simply decided the top players in the league and now Hall of Famers Jerry Rice and Deion Sanders will serve as alumni team captains for their respective squads and will choose their teams through a draft like process.